Bill Production is a leader in communication software solutions at low cost. Our intelligent software can easily send Bioscrypt V-Pass number directly in your existing application software without programming. It can also transfer data to Excel or Point Of Sale software. It's extremely easy to use and 100% reliable. Can also be used to create a log file (Date, Time, UserNumber) readings made by the scanner. 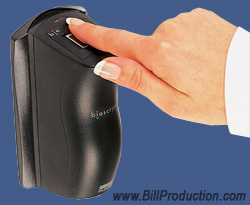 Inputs Bioscrypt V-Pass FX (biometric finger-scan) reader number directly into any Windows softwares as if it was typed in using the keyboard. Can also send the number directly in a field of any software and click on a button.